Visits: 63018 persons viewed this recipe. 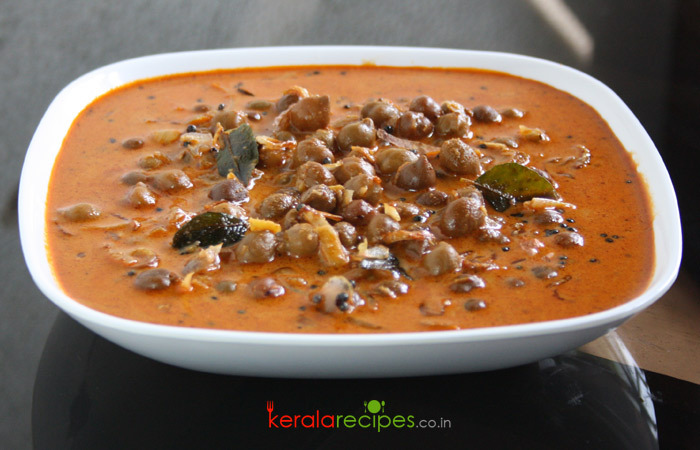 Kadala curry and Puttu, is the most famous food combination in Kerala breakfast. Kadala curry is prepared in many distinctive ways based on how the coconut is added. Coconut can be added in the form of ground paste, ground roasted paste or as coconut milk. Here we are going to prepare this recipe by adding coconut as ground roasted paste. Hope you will like it. Soak kadala (chickpeas) in water for minimum 8 hours and drain it. Chop shallots, ginger and garlic and keep aside. Heat 1 table spoon of coconut oil in a pan and put garlic, shallots, ginger and grated coconut one by one. Stir it until the coconuts turns brown. Add garam masala, coriander, chilli and turmeric powders into it. Stir it for 2 more minutes. Remove from the flame and let it cool. Grind the roasted coconut using a mixer grinder without adding water. Add the ground mix to the cooked kadala and let it boil. Taste for salt. Heat 2 table spoon of coconut oil in a pan and put mustard seeds. When it splutters, put broken dry red chillies and curry leaves into it and saute it. Add this to the prepared kadala curry and transfer to the serving dish. 1) If you want more thick gravy, grind 4 table spoon cooked kadala and add to the curry. 2) Adjust the spices according to your taste. 3) If you don’t have garam masala you can use vegetable masala or meat masala or chicken masala as an alternate. 4) Tomato (1 No) can be added for sour taste. I learned a lot from your recipes… its really helpful as i love cooking too…thank you shaan etta.. Please post recipes without coconut.. today our people need it the most… we cannot think any recipe without coconut.. but its threatening for our life..
Hi Sheena, Thanks for the comment. I was really surprised about your health consciousness. In my point of view coconut is not so dangerous, it is all about how much you consume. Anyway I will try to post some recipes without coconut. Happy cooking! Onion is not mentioned in the list of ingredients. Is it optional? Hi Shyamkumar, I am sorry, it is shallots, by mistake I mentioned it as onion (step 4). We are not using onion for this dish. Thanks for the feedback. thanks shaan, for all the recipes. Kadala curry was awesome. I love all your recipes and it comes out very beautifully. Waiting for your next new recipes. Good attempt. Thanks. Looking for tasty recipes without coconut. Can sesame seeds be used as substitute for coconut. Can we make kadala curry without grated cocunut? Its quite difficult to get coconut here. Rosmi, Yes you can make this dish without grated coconut also. Then no need to grind the roasted mix, directly add it to the cooked ‘Kadala’. If you have coconut milk, add it to the curry just before seasoning (before step 7). How much coconut milk would you say can be substituted for this recipe? Thick or thin type? Thanks! SJ, Try by adding half cup of thick coconut milk. Very good recipe. Its easy to prepare and a good combination with puttu. Thank you..
Rose, Thanks for your good words of encouragement. Nice one. I love cooking. Thanks Anubala. Glad to know that you love cooking very much. Akhila, Thanks for trying this kadala curry recipe. I will try to include more recipes when the time permits. Hi Sir, this recipe is easy and tasty. Thank u so much and keep posting. All the Best. In first time my husband appreciate my cooking… bcos of u… thank you. Anusree, It is pleasure to know that you did it well and got appreciated by your hus. Thank you very much for the feedback. Is there no way to print out your recipes? It would have made life so much easier so that I could print them and try the recipe at home. It’s just impossible to sit and write all this out since we can’t copy it either to a word document. Susan, First of all sorry for the inconvenience. The printing and copying function is disabled in the website to prevent misuse of recipes. But the website is mobile responsive so that you can open it in the mobile phones or tablets while you are in the kitchen. I added pepper corns.. Was a yummy. Hi Shaan, Thanks for simple recipe, as my wife has travelled so missing homly food. Just thought to try my hands on cooking. Shaan etta today I tried kadala curry. It was very tasty. My husband told me it was superbb and all credit goes to u. thankuuuu soooo much for nice recipes. Rohini, I am happy that it worked out well for you. Thanks a lot for finding time to share your feedback.